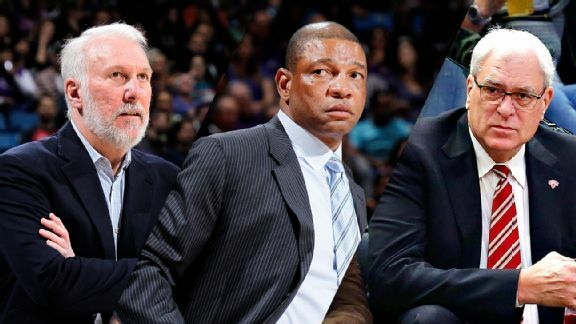 Which NBA teams have the best management? Worst? We're ranking every front office in the NBA, and -- surprise, surprise -- the San Antonio Spurs, who will be making their 20th straight playoff appearance, are No. 1. We asked our ESPN Forecast panel to rate every team's owner, basketball decision-maker(s) and coach from 0 to 10, and we then asked the panel to tell us how important each role is. ESPN Forecast is rating every franchise's coach, owner and basketball decision-maker from top to bottom. • Coaches: Where do Kerr, Doc, Pop land? In particular, we asked the voters to rate each team's front-office management on its guidance and leadership in terms of how it affects overall on-court success, both in the short and long term. From there, we calculated the ratings to determine the NBA's best and worst front offices. We'll break out the three categories -- coaches, team presidents/general managers and owners -- from Wednesday to Friday.